“Instagram beauty” has entered the lexicon of the makeup world, and there is no going back. The social media platform and the makeup enthusiasts on it, both artists and amateurs, have created an approach to beauty that has launched a thousand trends since. While it is impossible to define exactly what “Instagram beauty” connotes, its safe to say that it is a vibe as much as a look, one that many strive to emulate. Many luxury beauty brands do not count “Instagram beauty” as a pool they want to dip their feet into, but Dior Makeup has done the contrary. The launch of its Dior Backstage collection — an entirely new makeup line separate from its namesake beauty range — is the kind of brand that will draw millennials who double-tap for sport, down to the shops. Making its debut at the brand’s Cruise 2019 runway in Chantilly, Dior Backstage is currently available on the brand’s website and is slated to launch at Sephora in the US this 15 June. While there is no news yet as to when it’ll come to Asia, we’re crossing our fingers that the time will be soon, as there is much to anticipate. Peter Phillips and Bella Hadid. Backstage is designed chiefly by Peter Phillips, the creative and image director for Dior Makeup. He is a makeup artist, first and foremost, so the blueprint of the new collection is very much in line with the needs of those involved with makeup artistry, without neglecting what we dilettantes want. 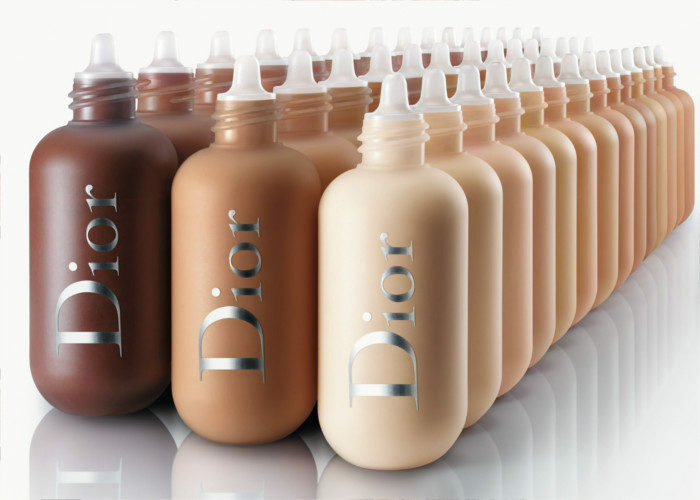 The Dior Backstage foundation also comes at a price point more affordable than its core range. 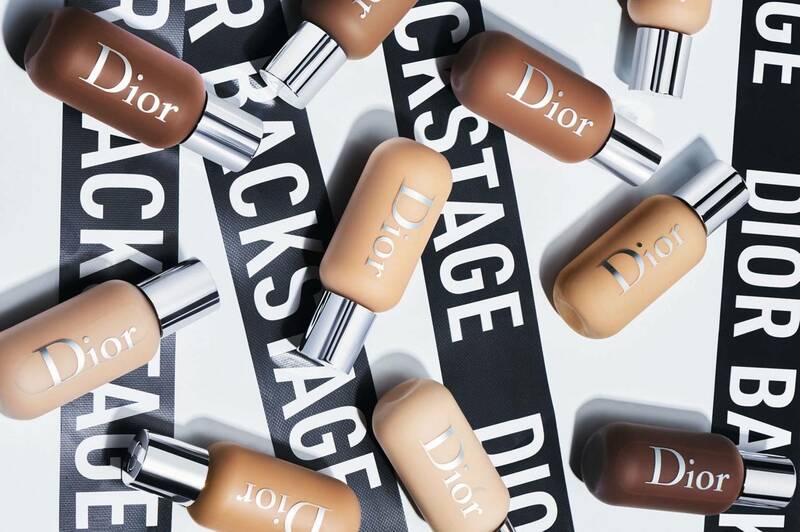 The Dior Face and Body Foundation had us hooked right off. Housed in clear acrylic vials that recall paint tubes with Dior in silver lettering, the sheer, yet extremely buildable waterproof base comes in 40 different shades. Yes, it is the norm for beauty brands to have inclusive shade ranges these days, but we still have to give Dior Backstage that due credit. The shape of the bottle allows for quick and easy mixing of shades as well. As compared to the signature Airflash foundation, which offers a matte and high-coverage finish, the thinner formulation of the Face and Body seems far more comfortable for everyday wear. The glow it imparts to the skin after use is also right on trend. The palettes, from left to right, anti-clockwise: The contour palette, the Glow palette, the brow powders, the lip palette, the brow powders, and the warm eye palette. Compact palettes form a bulk of the Backstage range, which could be because of its portability — easy enough to fit in your purse or a full-blown kit. The contour palette is designed in collaboration with Bella Hadid, the queen of cheekbones. The two matte and shimmer shades have rather neutral-to-cool undertones that give the illusion of cut shadows on the planes of the face, rather than the beach-bronzed look that most warm contour powders provide. Those obsessed with highlighters can jump on the Glow palette, a highlighter quad with a pearl, gold, rose pink and copper shade. Dior has refreshed its highlighter formula for this product, making it creamier so it delivers a dewy sheen to the skin, but if you are not a makeup artist, we see little need for an item with such disparate shades. There are two eyeshadow palettes, elegantly divided into a warm and cool-toned array of eight shades each. The warm palette contains rich, fall hues with peach and burnt orange tones that are all the rage now, while the cool palette comprises rosy, mauve hues that are the season’s essentials. Each comes with a cream eyelid primer built into the palette, which adds to its travel-readiness. Capping off the highlights of the collection is the lip palette, a selection of nine different neutral lipsticks created to suit all skin tones. There are three distinct formulas — sheer, satin and matte. 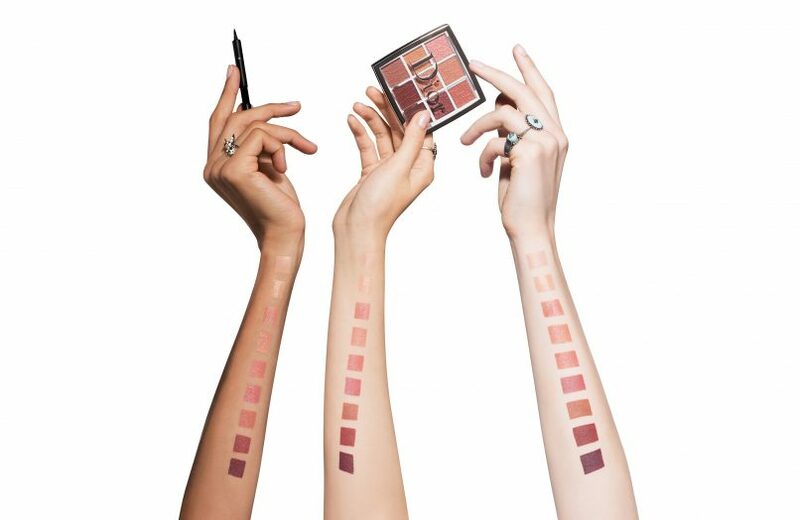 You might be hard-pressed to think of a use for nine different lipsticks, but we vouch that the Backstage lip palette will quickly become the key to transforming a day look to a night one on a busy workday. Concealers, brow powders, makeup tools and a lip balm also form part of the preliminary Dior Backstage brand. Stay tuned for updates here when it hits local shelves.